Tripod walking robot developed by Dr. Heaston, Prof. Hong, Dr. Morazzani, Dr. Ren, and Dr. Goldman at the Robotics and Mechanisms Laboratory of Virginia Tech. 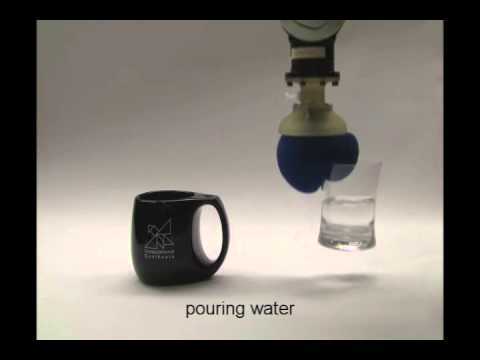 Universal robotic gripper based on the jamming of granular material. This video presents dynamic locomotion of a passivity-based, biped robot which contains biologically inspired bi-articular springs. The platform was developed for the purpose of understanding the roles of diverse muscle groups in human legs. A set of mechanical tension springs was incorporated to simulate muscles including bi-articular muscles which span two joints. This video demonstrates a behavior-based control algorithm for autonomous operations in militarily-useful scenarios on numerous hardware platforms. This video shows that the algorithm is robust in complex operational environments, enabling the autonomous vehicle to react quickly to changing battlefield conditions. This video shows highly accurate (within 2 cm) guidance of a tractor and an implement. The tractor is speed-controlled and follows a specified path very accurately. The implement is a seed planter which also follows the same path with the same accuracy. The implement has its own power unit. Its wheels are steerable and driven under force control as demanded by the force sensor at the hitch point. This relieves the tractor from having to pull the implement with full force, and hence it can be a smaller machine. Highly precise planting and path- following repeatability enables plant-level care which significantly reduce the chemical use, hence reducing adverse environmental effects and cost. Robots! Robots on Mars and in oceans, in hospitals and homes, in factories and schools; robots fighting fires, making goods and products, saving time and lives. Robots today are making a considerable impact on many aspects of modern life, from industrial manufacturing to healthcare, transportation, and exploration of the deep space and sea. Tomorrow, robotswill be as pervasive and personal as today’s personal computers. This chapter retraces the evolution of this fascinating field from the ancient to themodern times through a number of milestones: from the first automated mechanical artifact (1400 BC) through the establishment of the robot concept in the 1920s, the realization of the first industrial robots in the 1960s, the definition of robotics science and the birth of an active research community in the 1980s, and the expansion towards the challenges of the human world of the twenty-first century. Robotics in its long journey has inspired this handbook which is organized in three layers: the foundations of robotics science; the consolidated methodologies and technologies of robot design, sensing and perception, manipulation and interfaces, mobile and distributed robotics; the advanced applications of field and service robotics, as well as of human-centered and life-like robotics. Following the 2000 history video entitled robots, a 50 year journey (Video ID 805), this new collection brings some of the most influential robots and their applications developed since the turn of the new Millennium (2000 and 2016). The journey continues to illustrate the remarkable acceleration of the robotics field in the new century. These are Essex autonomous robotic fish tested in a public fish tank in the London Aquarium. The video was captured during preparations for unveiling the World's first autonomous robotic fish in 2006. It was reported by BBC and other news outlets. There are three motors on the tail joint. The skin is cosmetic and water flooded. The various models are labelled G6 , G8, andG9. This video shows how a "fish" detects the tank wall and other "fish" by IR sensors and changes its path to avoid collision. This video provides an illustration of graph-based SLAM, as described in Chap. 46.3.3, Springer Handbook of Robotics, 2nd edn (2016), performed on the campus of the University of Freiburg, Germany. BONES is a 5-DOF, pneumatic robot developed at the University of California at Irvine for naturalistic arm training after stroke. It incorporates an assistance-as-needed algorithm that adapts in real time to patient errors during game play by developing a computer model of the patient's weakness as a function of workspace location. The controller incorporates an anti-slacking term. SUE is a 2-DOF pneumatic robot for providing wrist assistance. The video shows a person with a stroke using the device to drive a simulated motor cycle through a simulated Death Valley. Teaching by demonstration is a typical application for impedance controllers. A practical demonstration was given with the task of teaching for automatic insertion of a piston into a motor block. Teaching is realized by guiding the robot with the human hand. It was initially known that the axes of the holes in the motor block were vertically oriented. In the teaching phase, high stiffness components for the orientations were commanded (150 Nm/rad), while the translational stiffness was set to zero. This allowed only translational movements to be demonstrated by the human operator. In the second phase, the taught trajectory has been automatically reproduced by the robot. In this phase, high values were assigned for the translational stiffness (3000 N/m), while the stiffness for the rotations was low (60 Nm/rad). This enabled the robot to compensate for the remaining position errors. For two pistons, the total time for the assembly was 6 s. In this experiment, the assembly was executed automatically four-times faster than by the human operator holding the robot as an input device in the teaching phase (24 s), while the free-hand execution of the task by a human requires about 4 s.